He understands everyone's concern, but Jake Luton says it's not even on his mind, unless someone mentions it. The brutal hit he took against Washington State last September that left him with a thoracic spine fracture and ended his 2017 season after four games is a distant memory, Luton says. 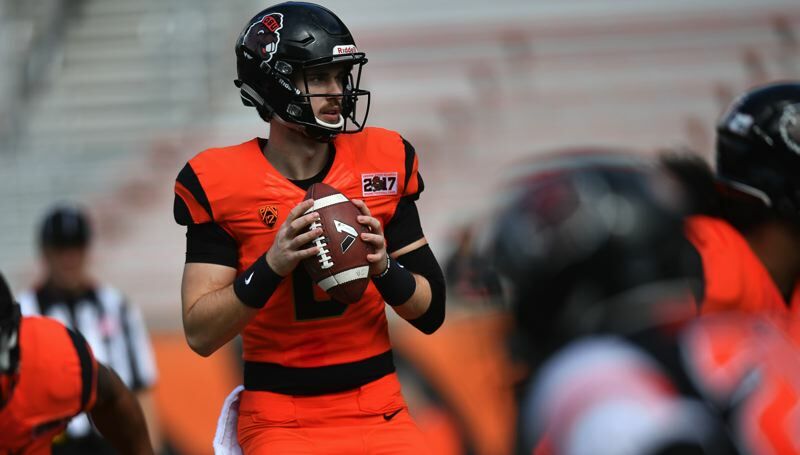 "The way it was explained to me (by doctors), there is no greater risk for me to get injured than anyone else stepping into the field," Oregon State's senior quarterback says. "It just needed some time to heal up." Luton began throwing and doing football-related activities in January and was at pretty much full strength through his first spring practice with new head coach Jonathan Smith. Going into the Friday opening date of training camp, Luton is in good physical stead. "I feel like I'm back to my old self, or even better," he says. "I'm stronger than I've ever been." The Beavers went live during scrimmages a couple of times in the spring, allowing Luton to take a few good hits. "It was nothing new, but it was all good," he says. "It was totally fine for me to get out there and get back on the horse. I'm going into my 18th season of football. It's what I know. I know everyone around me is concerned, but for me, it's business as usual." The 6-7 Marysville, Washington, native weighs 230 pounds after two good months in the weight room. Luton and the other veteran quarterbacks — sophomores Conor Blount and Jack Colletto, sophomore and redshirt freshmen Aidan Willard and Nick Moore — have organized team activities this summer without the OSU coaches, per NCAA regulations. "We've been in the weight room a lot, working with the strength and conditioning staff," Luton says. "Twice a week, we'll do full team-related stuff — including linemen — for about an hour. On Thursdays, the skill guys get together for seven-on-seven drills. And at least two other times (a week), we're out there throwing, me and the receivers. It's been good. Everybody has been getting after it." Luton hasn't seen much of offensive coordinator Brian Lindgren this summer. "It's been crazy busy for the coaches," Luton says. "They're out recruiting and running camps and trying to get into new homes with their families and planning for next season. After we start, I'll see him all day, every day for at least a while. "During the spring, we got to know each other. He's a super knowledgeable guy. It seems like we have similar personalities. We hit it off really well. I've enjoyed our relationship so far." Luton has been busy this summer. Besides football activities, he is taking 12 summer-school credits. He lives with his girlfriend, Paige Holland, and their 2 1/2-year-old labradoodle, Remi. "Any day I can get out pretty early, we try to bring Remi down to Avery Park or the (Willamette) river, to let him swim out and cool off," Luton says. "He is full of energy. He keeps us on our toes." Luton plans to win the starting quarterback job. "That's been the plan my whole life," he says. "I'll do my best to carry out that plan. If the coaches decide I'm the guy, great. If it's another guy, I'll support him and do what I can to help him and help our team win. "My experience last year put a lot of things in perspective for me. That's the first time in my life I was seriously injured. This year, I'm trying not to think too far down the line. I just want to give it my all and appreciate the game of football and being with my teammates." Luton says that attitude has helped him "tremendously" as he begins preparation for the Sept. 1 opener at Ohio State, which is ranked No. 4 in Sports Illustrated's preseason poll. "We're all going to do everything we can do to give ourselves the best chance to win that game," he says. "And then we'll try to do that game by game through the season. If it all adds up to a bowl game, that would be great. "I can't wait (for the Ohio State game). It's like any other game once you get onto the field. But I don't think there's any kid who dreams of playing big-time football who doesn't look forward to playing in front of 100,000 people."